What a difference 12 years and an anniversary makes. 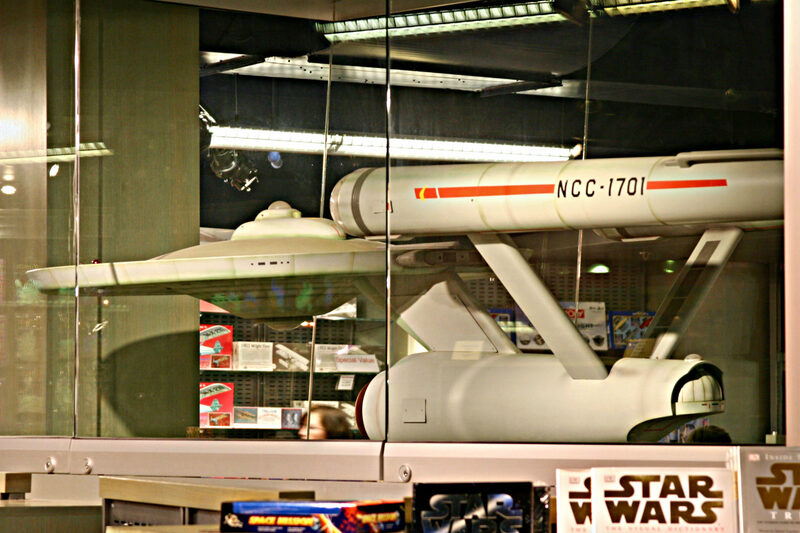 Here is the Starship Enterprise on display in the Air and Space Museum, October 2004. In celebration of the TV show’s 50th airdate—Sept. 8, 1966—celebration. the Smithsonian has restored the original 11-foot relegated to the, ah, hum, bookstore when I first sighted and shot it using Canon 20D. Vitals: f/5.6, ISO 400, 1/20 sec, 85mm. I wouldn’t call any of the four pics taken to be great photography, but they’re personally iconic. This is most useable among them. Hehe, is that Star Wars crap for sale before the great Lady of the Stars? For shame!